I’ve written about how robots have changed over the years from a historical perspective, but not how we’ve actually constructed them. Let’s face it, robot stores were certainly not around 40 years ago, and even today, there are only a tiny fraction of the stores we’d like to see for our robot experimenting as compared with computers. There are hundreds of thousands of computer stores and companies around the world but only a few actual robot stores, and less than a hundred robot companies that deal with robots for the experimenter. As I mentioned in my previous column, we keep hearing about the arrival of the ‘robotics age,’ but many seem to find that it really is not here, but just around the corner. Military robots, insect-like walking and humanoid robot kits, and even floor-sweeping Roombas now seem a bit blasé. Some experimenters are already hanging up their soldering irons to wait for the next killer app to come along in another field. We want working robots right out of the box or an easy-to-assemble kit. The creativeness of electronics enthusiasts seems to be history. It’s a shame that some are changing their interests to other areas of science. Though the economy has taken a dip, robotics truly is making amazing strides. Magazines such as SERVO, Nuts & Volts, and the like, still have great schematics and circuit board layouts, but the pages of most popular magazines that used to feature build-it-yourself articles no longer have construction articles for mechanical projects. Building a desk or garden shed from scratch is frequently featured in many magazines, but not how to build a garden tractor or other mechanical projects. Certainly there are crafty people still around such as the stars of Myth Busters, but they are a minority it seems these days. Possibly the slow economy and resulting tightened budgets will resurrect the creative bent in us so that home-built robots will once again become popular. We take for granted all the motors, sensors, high power density batteries, and microcontrollers that are contained within today’s experimental robots. The model airplane servo that so many builders use as the base of their robot designs was still in the future 60 years ago. In those days — besides a lucky find at a war surplus store — it was hard for a robot experimenter to find good parts. Some of the best sources for robot parts were old appliances such as washing machines, food mixers, electric fans, refrigerators, record players, and 115 VAC power tools. Cars had fans, windshield wiper motors, and various wiring harnesses. Bicycles had neat chains, bearings, gears, and even hardened steel spokes. Boats and boat motors had some great parts for robots. Hardware stores had hinges, door and cabinet hardware, plumbing items, shafts, and threaded rod stock. Some of the very best parts came from jukeboxes and pinball machines. Anything with parts that could be moved usually had something that was useful to robot builders. Growing up in a small town (Mount Olive, NC), my robot parts sources were empty coffee cans and heating duct sections for robot shells, plywood structures, and various weird things from junkyards. I also had access to jukebox parts and other surplus things my brother got in the big city of Raleigh. When I later moved to Long Beach, CA near Los Angeles, I was in robot builder’s heaven. Notice that I did not mention any sort of electronics. Of course, there were no computers and therefore, no printers, hard drives, and other similar itmes. Certainly there were no microcontrollers or ready-built motor drivers available to experimenters. Office machines usually consisted of typewriters, mimeograph machines, and various types of adding machines, and had little usable parts for robots. Entertainment electronics back then were radios, TVs, movie projectors, phonographs, and associated amplifiers and speakers for these items. Most electronic products were hand-wired from point-to-point and large capacitors, transformers, and other components could be removed for projects. The robot experimenter was usually left to his or her own imagination when it came to using these types of parts for robots. Robots were frequently built upon plywood bases, held together with wood screws, nails, and glue in the ‘50s. Most of the earlier robotic creations were fairly large so wood seemed natural for the shells of robots. There were few sources for aluminum angle extrusions so most people used steel for the inner structures. Wheels may have come from lawn mowers, the occasional scooter, large toy, or roller skates. Most motors available to experimenters were not geared down so belt and chain reduction systems connected the motors to the wheels. Many of the early robot designs used the ‘Ackermann’ type of steering that is used in all cars instead of the differential type of steering popular today in robots. In this configuration, the back (or front) wheels were used for forward or reverse movement and two of the wheels were connected together to steer right or left by another ‘steering’ motor. Sometimes a single wheel was steered by a steering motor and that single wheel could also be powered by a drive motor. Figure 1 shows Grey Walter’s Elmer robot and the gears that drive the front wheel in this configuration. FIGURE 1. Grey Walter’s Elmer. 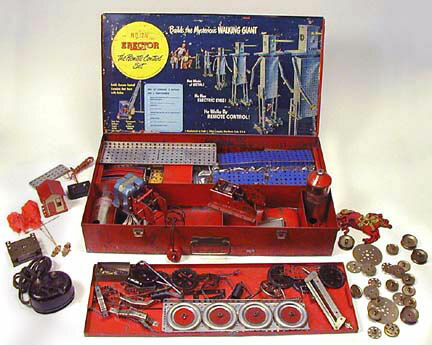 Good old Gilbert ‘Erector Sets’ had some of the best parts to experiment with mechanical configurations. Figure 2 shows a set from 1949. Notice that it features a remotely-controlled robot and you can see the AC motor sitting in the metal box with the red gear train behind. The motor supplied with these sets was not only a gearmotor, but it had several different geared output speeds. Since it was an AC shaded-pole motor, you were stuck with the speeds on the side of the gearbox. FIGURE 2. Gilbert Erector Set #12 and one half. Few robots had any sort of variable speed control, whether for the base or for any sort of arms or other extremities. Cables and even fishing line were frequently used to transfer motion from one part of an arm to the ends to allow weighty driving motors to be located in areas easier for the main arm motor to lift. It wasn’t AI as we know it today, but Walter did some amazing things with two tubes in his amazing little robot. Those that followed also built some surprising robots with only relays, switches, CdS photo cells, and lots of hard-wired wire connections. Early experimenters did not have the luxury of today’s vast array of battery chemistries, amp-hour capacities, and low costs. Many robots of that era used simple dry cells, usually the D sized carbon-zinc type. AA cells were called penlight batteries and there were no alkaline types at that time. C cells were smaller and less than half the capacity of a D, yet cost the same, so most experimenters used D cells. The other batteries were smaller six and 12 volt lead acid batteries, usually the smallest battery that you could find from a farm implement or similar. There were no easily obtainable sealed electrolyte lead acid batteries so you just hoped your robot didn’t turn over and eat its innards and everything in sight with the spilled sulfuric acid. Some experimenters opted for 110 volts from a wall plug as AC motors were cheaper and more available. Of course, the poor robot was tethered to the wall by a long cord. Toys in the ‘50s began to have battery-powered DC motors; usually three volts. Remotely controlled cars with a wired handheld remote control were popular. Some toys even had attached gear trains — great for the slower speeds with the greater torque needed for robots. It was a real plus if you could start with one of those tinny imported robots and peel it apart to modify it with moving arms and head, or change its walking mechanism in some way. There were no LEDs in those days, but many toy robots had little colored three volt incandescent bulbs for eyes that could be used in another location. Of course, the purists would scream if the robot was even taken out of its original box and would cry in their beer if it was taken apart. Let’s jump ahead 50 years to the present without even looking at the robots available 20 or 30 years ago. Money is a bit tight these days for all of us but that hasn’t stopped entrepreneurial companies from developing some amazing robots for experimenters. For that matter, experimenters have, themselves, developed some cutting-edge robots that have been exhibited at conferences and exhibitions around the world. Kids as young as kindergarten age have learned robotic techniques and programming that wasn’t even available to university level students a few decades ago. Companies such as LEGO, Robotis, Parallax, and others have brought affordable and capable robotics kits to youngsters to teach them this exciting science. What were the key ingredients that made all this possible? Well, I believe that all of us will probably say that it was the personal computer and the ability for the average person to program simple microcontrollers to control some fairly sophisticated robots. The microprocessor came first as the core of the PC, with the microcontroller making the scene a bit later. The latter did not require the higher level languages needed to communicate with humans; only for a robot to understand a suite of sensors and control some functions by driving a motor(s). 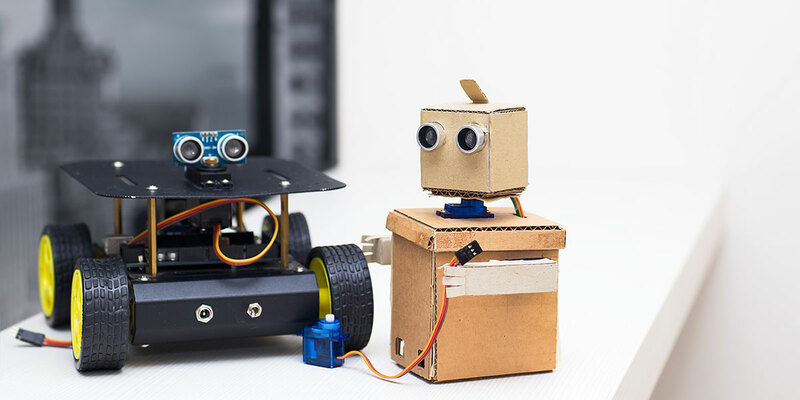 Simple languages and low prices brought the microcontroller within the budget of even the most cost-conscious robot experimenter. You might ask, “What about the mechanical aspects of robotics?” A robot is not a robot without some sort of mechanical means to affect its environment; whether that be to just roam about an area or manipulate something with an arm and end-effector. Low cost motors, and especially gearmotors, allowed builders to add all sorts of movement to their robots. The model airplane servo that I mentioned earlier was a boon for those who did not have the mechanical expertise to hook up a set of surplus gearmotors to some wheels. These ready-made drive motors were ideal to drive small table-top robots when they were hacked to obtain continuous rotation. They also had the advantage of being able to listen to a microcontroller’s generated series of pulses right out of the box. Inexpensive active IR and ultrasonic rangefinders, compass modules, GPS receivers, color detectors, image recognizing cameras, and a host of other sensors provide today’s robot experimenters with amazing capabilities. Another real turning point in build-it-yourself robots was the growing interest in combat robots — robots that battled each other until one finally beat the other. In the beginning and for many years afterward, there were no kits available for these types of robots so the prospective robot warrior had to design and build his or her own. The earliest combat robots had fairly weak weapons and many went on to win a contest by simply sliding under its opponent to prevent it from moving away. Virtually all of the combat robots were and are remotely controlled by model aircraft types of radio systems, though there are a few purists who have built some fairly sophisticated autonomous robots for the combat arena. The sport reached a pinnacle when the Comedy Channel aired the popular BattleBots series. The weight classes greatly expanded from the initial light-middle-heavy weights to categories from ant weight to super heavyweight. So, how have things changed over the years in the way we’ve constructed our robots? We started out with simple sketches on paper and many of us have progressed to CAD programs and finite element analysis software on our computers. Grey Walter’s robot tortoise (amazing for the time) was a simply constructed thing with a bent tin structure and household-type fasteners. We have progressed from mostly plywood and wood with steel inner structures to plastic with aluminum structures, and even titanium for many combat robots. Battery technology has advanced from the early dry cells and lead acid batteries of Walter’s time past nickel cadmium to expendable alkaline cells and lithium polymer, lithium-ion batteries, and even fuel cells. Robot power started with inefficient series-wound DC motors and evolved to the very efficient rare-earth field and coreless motors of today. Relay and hard-wired logic gave way to microprocessors such as the 6502 and the latter microcontrollers such as the 68HC11, PIC, and others. Rudimentary light detection and vision arose from the lowly cadmium sulfide photo cell to true vision with video cameras and intelligent CCD/CMOS cameras such as the CMU cam. The dream of affordable speech recognition systems is now a reality for our robots. Have we reached the epitome of robot evolution? Our robots cannot only recognize our faces but they can respond to our voices and commands with their own speech. Many can walk upright just like us and have dozens of motors/servos to create many motions. Some even move about on two side-by-side balancing wheels or a roller skate-like foot like Rosie (Figure 3) on the old Jetsons cartoon series. FIGURE 3. 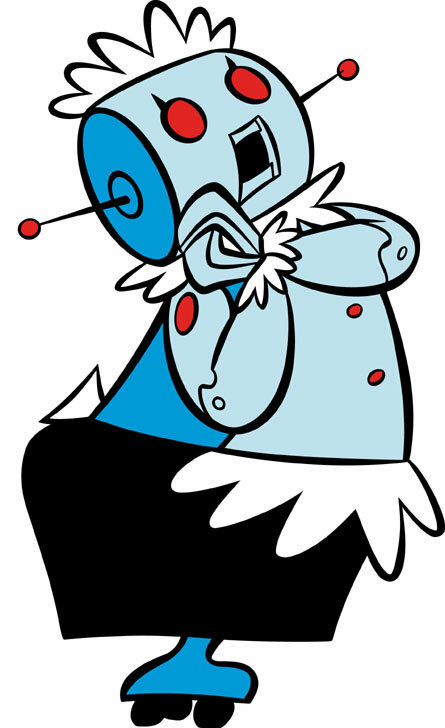 Rosie from the Jetsons. We have made some amazing strides in technology, but we have many huge leaps and bounds ahead of us. Today’s batteries have incredible power density but they remain one of the major pitfalls of creating a true home robot that has the physical power of a similar-sized human. 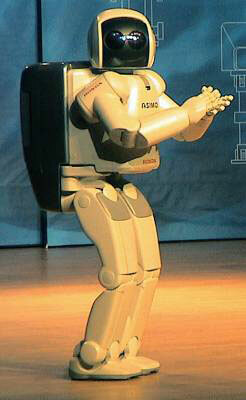 Honda’s Asimo must walk around with a huge backpack battery in order to operate for less than an hour (Figure 4). The energy crunch of today may actually produce as a side product a very high density battery that will have the capacity to power future robots. The latest rare-earth field DC motors are powerful with several horsepower available in fist-sized packages, but tomorrow’s electro-chemical muscles on the drawing boards may be the answer for future humanoids. Wheels not withstanding, most of the functions and motions on a complex humanoid robot can more easily be accomplished by linear actuators much like our muscles. Our shoulder, elbow, head, and similar motions use our powerful chemical powered muscles to produce partial rotation of our joints. Artificial robot muscles that have long been a dream of scientists and labs around the world are now becoming a reality. The available microcontrollers and microprocessors are becoming more versatile and cheaper, but possibly something on the order of Isaac Asimov’s ‘positronic brain’ may be on the horizon. Unlike the DRAM memory that I paid an extra $40 to upgrade my Rockwell AIM-65 computer from 1 KB to 4 KB back in the early ‘80s, memory is dirt cheap these days. A GB of DRAM is less than $50 and Flash memory is as cheap as $50 for 8 GB — a million times cheaper!